Interested in aviation, youth leadership, or service to your country? Join the Lebanon Composite Squadron for our Open House on Monday, 30 October at 7pm at the Granite Air Center at the Lebanon Airport (by the tower). If you’re 12 to 70+ and looking for a challenge, join us for an informative introduction to the official civilian auxiliary of the U.S. Air Force. Meet our cadets and hear first-hand what it’s like to be a cadet. Learn about the incredible opportunities we have to offer, including leadership development, orientation flying, summer activities, academic scholarships, STEM Education and much more! We’ll explain all the benefits of belonging to one of America’s finest youth programs. Parents, please join us for this event as well. Air Force Auxiliary adult leaders will be on hand to answer your questions and tell you about opportunities for adults. As in previous years, the Lebanon squadron will be supporting the Prouty this year on Saturday, 9 July. If you have signed up to help out with the Prouty, please arrive at the Richmond Middle School at 0600. Check in at the volunteer tent. BDUs or other CAP uniform. Please pick up a volunteer shirt when you arrive and wear that with your BDU pants. As in previous years, the Lebanon squadron will be supporting the Prouty this year on Saturday, 11 July. If you have signed up to help out with the Prouty, please arrive at the Richmond Middle School at 6:00 AM. Check in at the volunteer tent and ask for Bill Brown. If you are driving a personal vehicle, please park in one of the volunteer lots. If you cannot arrive until later, please contact Maj. Rangi Keen. As in previous years, the Lebanon squadron will be supporting the Prouty this year on Saturday, 13 July. Note that there will be no camping this year. If you have signed up to help out with the Prouty, please meet at the Richmond Middle School at 6:00 AM in the parking lot at the back. If you are driving a personal vehicle, please park in one of the volunteer lots. If you cannot arrive until later, please contact Capt. Rangi Keen. BDUs or other CAP uniform. Please pick up a volunteer shirt when you arrive and wear that with your BDU pants. C/SSgt Joah Moss and C/Amn Matthew Cota under their shelter. 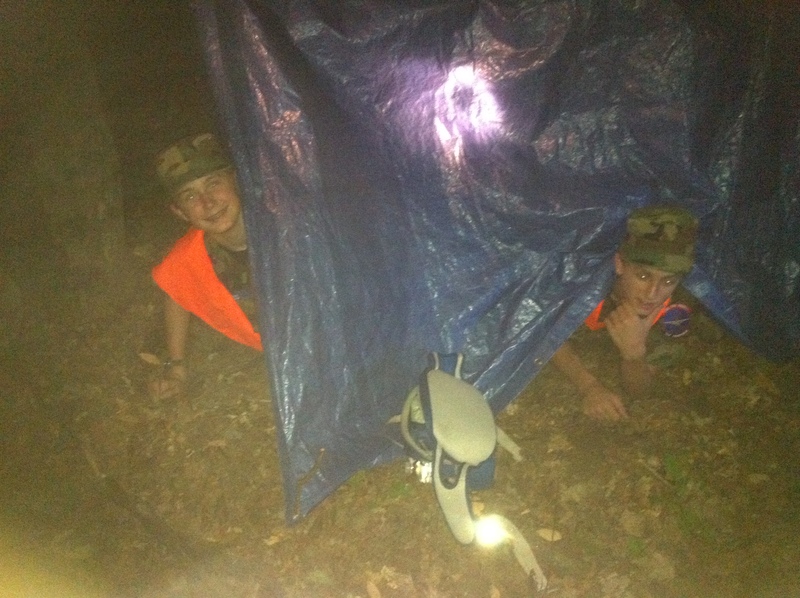 Lebanon Composite Squadron cadets led by Major Brechbühl and Captain Moss built shelters out of tarps and rope in the dark this past Monday. Current and former members of the Lebanon squadron were in attendance at Steve Crooker’s memorial service today. Crooker was a long time member of the Lebanon squadron and was commander of the squadron in the early 90s. During his command, he and the cadets at the time designed and constructed a full size motion flight simulator that enabled the squadron to receive recognition and awards at the local and national level. 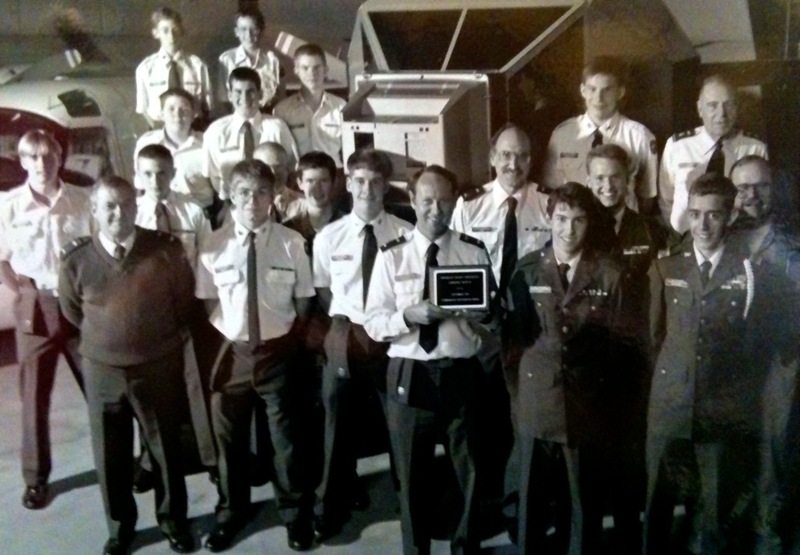 Pictured above at the memorial service are former cadets holding a photo of the squadron with the flight simulator they built. 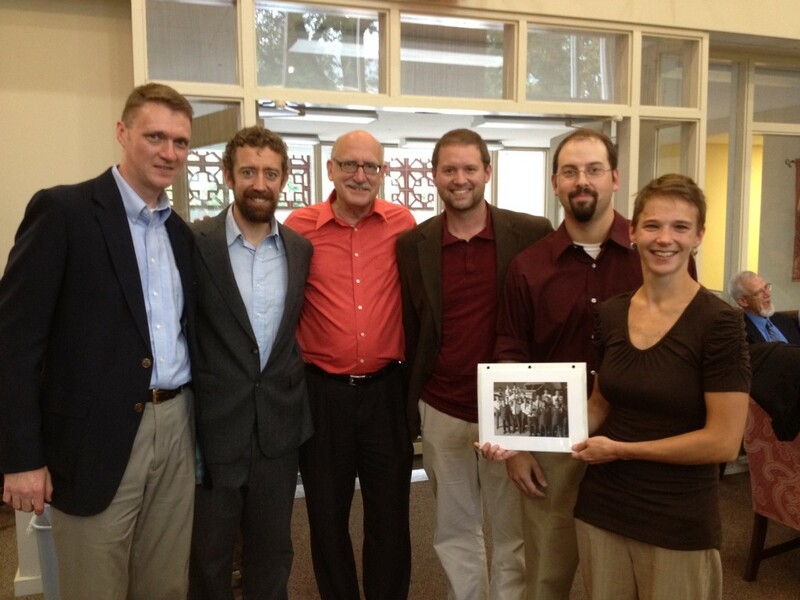 From left to right, the former cadets are Colin Skinner, Adam Bouchard, Jorgen Strycharz, Kevin Guay, and Erin O’Connell, Crooker’s niece. Below is a full size of the photo they are holding with Crooker holding the plaque the squadron received in recognition of their achievement. Unfortunately, the flight simulator was destroyed a couple years ago when the building it was stored in burned. 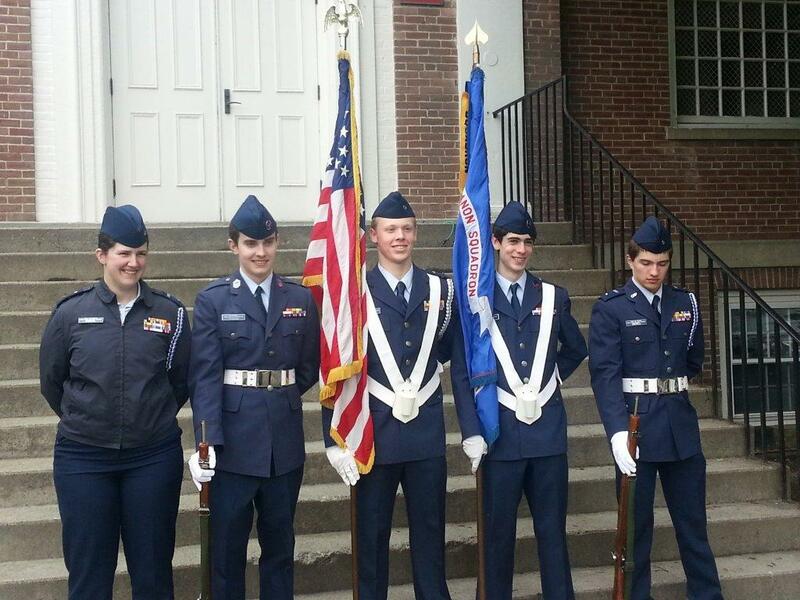 The Lebanon Composite Squadron will be supporting the Boston-Portsmouth air show at Pease Tradeport this weekend. If you enter at the south entrance, we’ll see you there. Stop by and see our CAP aircraft and the Blue Angels. All members attending should bring a completed CAPF 60 (download: Word, PDF). Cadets should also bring a signed CAPF 31 (download: Word, PDF). Update 1 July: Our members along with other squadrons from New Hampshire, Vermont, Maine, Massachusetts, and Connecticut as well as the Boy Scouts and other volunteers handled 65,000 visitors to the air show. It was a hot two days, but everything went smoothly and we were even able to enjoy the Blue Angels’ show at the end. If you haven’t yet signed up, it’s not too late; just contact Capt. Rangi Keen.